The facts and opinions stated in this article were not produced by the Diamondback editorial department. Making Change at Walmart is solely responsible for the content. According to a 2017 Nielsen report, Generation Z, those born in or after 1997, make up 26 percent of the nation’s consumers. When you add in Millennials, born in or after 1980, that’s 48 percent. Millennials also spend close to $600 billion a year, while Generation Z has access to $44 billion in buying power and its growing every year. Make no mistake, it is the demographic and spending power which is the real power of these two generations. This power, however, also comes with great responsibility – the responsibility of realizing where you shop can, literally, change the direction of the nation. Where and when these two critical generations spend money defines not only our values as a society, but helps shape and influence the behavior of industries and corporations. One company that Millennials and Generation Z have the power to influence is Walmart. Why Walmart? As the largest employer in the nation, with 1.5 million employees, how Walmart treats its workers not only impacts its workforce, but also impacts our neighbors, friends, and families. It shapes our economy and society in ways that go far beyond the local supercenter or Sam’s Club. Because of Walmart’s low wages, inadequate benefits, and insufficient scheduling, thousands of its workers are forced to rely on government assistance to survive, costing taxpayers an estimated $6.2 billion every year in Walmart corporate welfare, according to a 2014 Americans for Tax Fairness report. Walmart has appeared on the top of many state lists that rank employers with the most number of workers and their dependents on state health insurance programs, which is funded by taxpayers. As the largest importer of foreign goods, Walmart has also cost this country hundreds of thousands of jobs. Through Walmart’s trade relationship with China, an estimated 400,000 U.S. manufacturing jobs have been eliminated or outsourced between 2001 and 2013 alone, according to a 2015 Economic Policy Institute report. The elimination of an estate tax, which primarily benefits the top 10% of income earners and, according to Senator Bernie Sanders, would give the Walton family a tax break of up to $53 billion. In fact, 50% of Trump’s proposed tax cuts would only go to the top 1%. Trump hand-picked Walmart CEO Doug McMillon to sit on his Strategy & Policy Forum, which he later disbanded. But while on the business council during the June 2017 GOP health care debate, McMillon made no statements to protect healthcare for his workers against a bill that threatened to gut Medicaid funding, cause premiums and out-of-pocket expenses for low-income workers to shoot skyward, and eliminate employer mandate penalties. According to contribution data from Opensecrets.org, Walmart’s PAC has contributed more than $100,000 to key Trump appointees and supporters from Congress over the last two elections cycles. The Senate Office of Public Records reveals that Walmart has spent more than six million dollars each year since 2008 on lobbying the federal government for retail related issues. So, effectively, a portion of the money spent on every transaction made at Walmart has gone towards Walmart lobbying for issues that you, as a consumer, may not even support. These issues have included but are not limited to discussions of food and drug safety, health care, factory standards, and nutrition labeling policies. In 2010, Hunter College’s Center for Community Planning and the NY Office of Public Advocate reviewed dozens of studies on Walmart's economic impact and concluded that for every two jobs created by Walmart, an estimated three are lost across local communities. In fact, it found that a year and a half after opening a Walmart in Chicago in 2006, 82 of the 306 surrounding small businesses shut down by 2008. A May 2015 study by the Asia Floor Wage Alliance and Jobs with Justice surveyed many Walmart garment suppliers in Cambodia, India, and Indonesia and found a number of labor abuses ranging from wage theft practices and forced overtime, to instances of sexual harassment and violations of local labor laws. While Walmart says it has adopted some reform measures for its supply chain, supply chain worker advocates have argued that they don't go far enough to protect the safety of workers and that the changes have come too slowly. 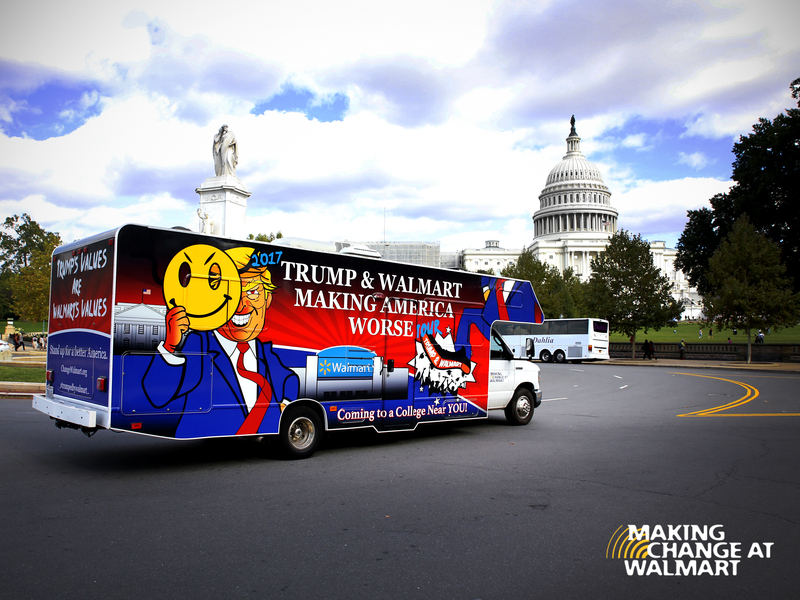 Aside from having a negative impact on politics and the workforce in the U.S., as well as foreign workers and small business communities, Walmart’s controlling family also has its sights on changing America’s schools. The Waltons have dedicated millions of dollars to dismantling the public education system and building up private charter schools. In fact, according to the Waltons 2016 foundation report, the Walton Family Foundation invested over 190 million dollars in what the foundation interestingly names “high quality school options.” The reality is that this has less to do with “high quality options” and more to do with an agenda that seeks to weaken public education. The Foundation for Excellence in Education noted in 2013 that “When charters siphon off kids, they not only take the money that comes with them, they often cause nearby schools to operate under capacity. This increases inefficiencies and per-student costs because all that empty space still must be maintained.” In other words, supporting choice may sound good, but actually it hurts the very children we are trying to help. Not surprisingly, the Walton family's extreme agenda is also mirrored by President Trump’s administration. Trump’s Secretary of Education, Betsy DeVos has spent much of her lifetime trying to siphon money out of public schools and into private charter school operators-- an effort strongly promoted, and funded, by the Waltons. Before her appointment, DeVos chaired a school choice organization, All Children Matter, which was founded in part by the late John Walton, and in 2008, was fined $2.6 million for illegal campaign donations by the State of Ohio. DeVos has also chaired the Alliance for School Choice, which based on the foundation’s reports, received more than $15 million from the Walton Family Foundation between 2012 and 2016. Given all the facts on Walmart’s negative political, social, and economic impact, the question that each of us must ask ourselves, especially the millions who make up Generation Z and Millennials, is this: do you support Walmart’s and the Walton's values or not? If you do, you should shop there with a clean conscious. But if you don’t share these values, and you still shop there, then you should realize that your money can be used against your values one day. For many college students, it is understandable that every penny counts. But saving money today means nothing if we all have to pay a higher social cost tomorrow. Make no mistake, the movement to change Walmart is not about one company, it’s about us deciding what kind of America we want to live in. That is why, from September 5 to October 4, Making Change at Walmart (MCAW) organizers traveled to 30 college campuses across the country as part of their ‘Trump and Walmart Make America Worse Tour.’ They reached over 1.6 million people with their message and signed up thousands of students to join the campaign to stop the Walmart agenda. While it may seem difficult to believe that one person can change Walmart, the truth is this: by standing together, and by speaking with our wallets and our voices, we can change Walmart. As one of the most progressive and outspoken generations in our nation’s history, Millennials and Generation Z have the unique power to make a difference, and the time has come to show this power by choosing to shop at stores that reflect our values. And, the simple reality is this: when you look at the facts, there is no value to shopping at Walmart given its current values.